Nice bright summery top which will be good either buttoned through or left as light "jacket" over sleeveless top. 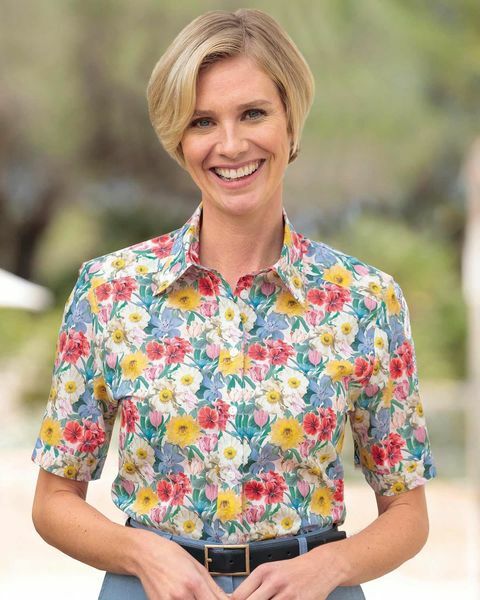 "Nice bright summery top which will be good either buttoned through or ..."
Ladies striking floral print blouse on pure Liberty Tana lawn. Short sleeved style with a two-piece collar and gently rounded hem. In shades of cyclamen, mimosa, airforce blue, dusky pink and sage on an ecru base. Mock turn back to sleeve hems. A pretty and versatile addition to any wardrobe..